Seven local skaters traveled to Ogden, Utah on Saturday, Nov. 12 to compete in the 2011 Wasatch Freedom Classic. Offering Snow-Plow Sam through Preliminary level figure skating events, the Freedom Classic's small competitive groups provided a great opportunity for the Sun Valley Figure Skating Club's younger skaters to hone their skills in competitive skating. Competing at the Pre-Preliminary level, Sheldon Gentling won her showcase event and placed fourth in the Free Skate competition. Murphy Kendall won her Basic Program Free Skate event at the Basic Skills Basic 6 level. Placing second were Aurora Wilkinson in the Free Skate event at the Non-Test level; Prescott Potter in the Free Skate and Artistic events at the Basic Skills Free Skate 5-6 level; and Christine DuFur in the Free Skate at the Basic Skills Free Skate 4 level. DuFur also placed third in her Artistic event. In addition, Jessica Blackburn took fourth, and Saba Grossman took fifth in the Basic Program Free Skate event at the Basic 8 level. 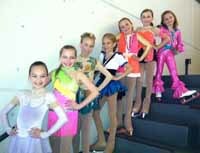 Pre--preliminary was the highest competitive level for Sun Valley skaters at this competition. Several Sun Valley skaters participated in United States Figure Skating Association test sessions in Boise and in Ogden on Nov. 6 and 13. The Sun Valley Figure Skating Club boasted 100 percent pass rate in Boise, with each skater who tested passing at least one USFS test attempted. The Club also had an impressive pass rate in Ogden. The following skaters passed Free Skate tests, moving up one level in their competitive rank: Novice Free Skate - Alexandra Harten; Juvenile Free Skate- Travis Flynt and Tara Ware; Pre-Juvenile Free Skate -- Emma Stuessi; Preliminary Free Skate -- Lane Letourneau, Katie Peters, Alex Stuessi and Blake Letourneau; Pre-Preliminary Free Skate -- Aurora Wilkinson, Karsyn Gerringa, and Prescott Potter. The following skaters passed Moves in the Field tests: Novice Moves in the Field -- Telar McClure; Intermediate Moves in the Field -- Katie Peters, Grace Hoffman and Sheldon Gentling; Juvenile Moves --Travis Flynt and Tara Ware; Pre -- Juvenile Moves in the Field -- Lane LeTourneau; Pre-Preliminary Moves- Murphy Kendall, Jessica Blackburn, Saba Grossman and Prescott Potter. Coaches Holly Wheeler and Judy Blumberg accompanied the skaters to the Boise test session, and Coach Darlin Baker accompanied the skaters to the Ogden competition and test session.